On summit day the team woke around 3 AM for a quick breakfast and hot drink. A snow-cat took them to their previous highpoint at Pastukhov Rocks (15,000′ / 4572m). From there it was almost 4,000 vertical feet (1,220 meters) to the summit of Elbrus, primarily on open moderately angled glaciers. 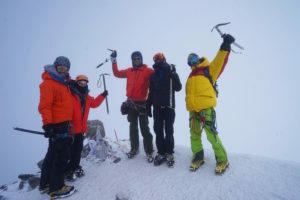 They reached the summit mid-morning and due to the low visibility they weren’t able to enjoy the typical stunning views of the Caucuses from Europe’s highest summit. The round-trip climb had them back to the Barrels Camp in about twelve hours. They safely made it off the mountain and to Azau, and soon back to Moscow!